I got my new car yesterday! It's a 2010 Subaru Forester. I just love that color, which is called Newport Blue Pearl. "Vroom?" she said quietly, and he felt a small internal jolt, like a punch in the stomach. "Whatsit, Daddy, what's it?" Jemmy had recaptured the toy and ran up to him, clutching it to his chest. "It's a...a..." he began, helpless. It was in fact a crude replica of a Morris Minor, but even the word "car", let alone "automobile", had no meaning here. And the internal combustion engine, with its pleasantly evocative noises, was at least a century away. "I guess it's a vroom, honey," said Bree, a distinct note of sympathy in her voice. "You're a love to bring me all the way up here," Roger said. "I didn't realize how far it was, or I'd never have asked." She gave him a brief glance of amusement. "It's a hundred and fifty miles!" She smiled, but with a wry edge to it. "My father always said that was the difference between an American and an Englishman. An Englishman thinks a hundred miles is a long way; an American thinks a hundred years is a long time." Jem had sat on Roger’s knee, gazing openmouthed out the window as they drove up the narrow road, the wind from the open window fluttering his soft, bright hair. Couldn’t wait to do it again. And once they’d got settled at Lallybroch, had pestered Roger into letting him drive the Morris Mini round the farm tracks, sitting in Roger’s lap, small hands clenching the steering wheel in glee. "With talcum powder," he assured her. He lifted the toy and set a front wheel spinning with a flick of his thumb. "Aye, it is a good one, isn't it? It isn't really meant to be a particular model, but I suppose I was remembering that Ford Mustang of yours. Remember driving down out of the mountains that time?" His eyes softened with memory, the green of them nearly black in the dim light of the banked fire. "I do. I nearly drove off the road when you kissed me at eighty-five miles per hour." I can't wait to take my own new "vroom" out on the road! The table of contents for the upcoming SONGS OF LOVE AND DEATH anthology (formerly known as STAR-CROSSED LOVERS) has been posted on George R. R. Martin's site here. Jim Butcher - "Love Hurts"
Jo Beverly - "The Marrying Maid"
M.L.N. Hanover - "Hurt Me"
Cecelia Holland - "Demon Lover"
Melinda M. Snodgrass - "The Wayfarer's Advice"
Robin Hobb - "Blue Boots"
Neil Gaiman - "The Thing About Cassandra"
Marjorie M. Liu - "After the Blood"
Jacqueline Carey - "You and You Alone"
Lisa Tuttle - "His Wolf"
Linnea Sinclair - "Courting Trouble"
Mary Jo Putney - "The Demon Dancer"
Tanith Lee - "Under/Above the Water"
Peter S. Beagle - "Kashkia"
Yasmine Galenorn - "Man in the Mirror"
Diana Gabaldon - "A Leaf on the Wind of All Hallows"
For those of you who don't already know, Diana Gabaldon's entry is the story of Roger MacKenzie's parents. You can see more information about "Leaf on the Wind" here, and excerpts on Compuserve here. 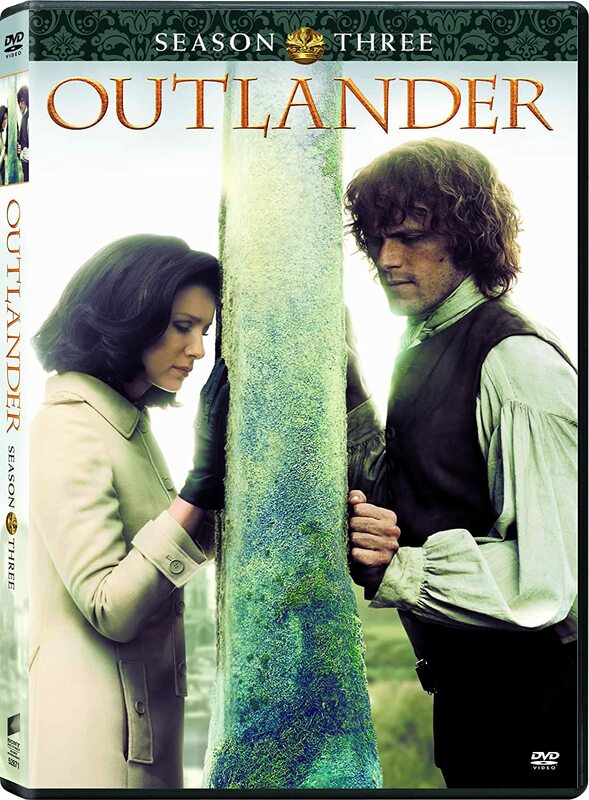 From what I've seen so far, it looks like it's going to be a really good story, a must-read for OUTLANDER fans. UPDATE 8/11/2010 1:22 pm: Publication date is November 16, 2010. Those of you who frequent Diana Gabaldon's section of the Compuserve Books and Writers Community may remember the wildly popular "Outlander Pursuit" trivia game, which kept many of us on the forum entertained for a full three months in the spring of 2009. The premise is very simple: The first person asks a question. Whoever posts the correct answer first gets to ask the next question. And so on. The only restrictions being that the questions must be factually based (no speculation, no opinions) and the answers must be found in the books. We've started a new round of the game, and you're welcome to come and join us. But if you haven't yet finished AN ECHO IN THE BONE, you may want to wait until you do, because questions from ECHO are included in this game. 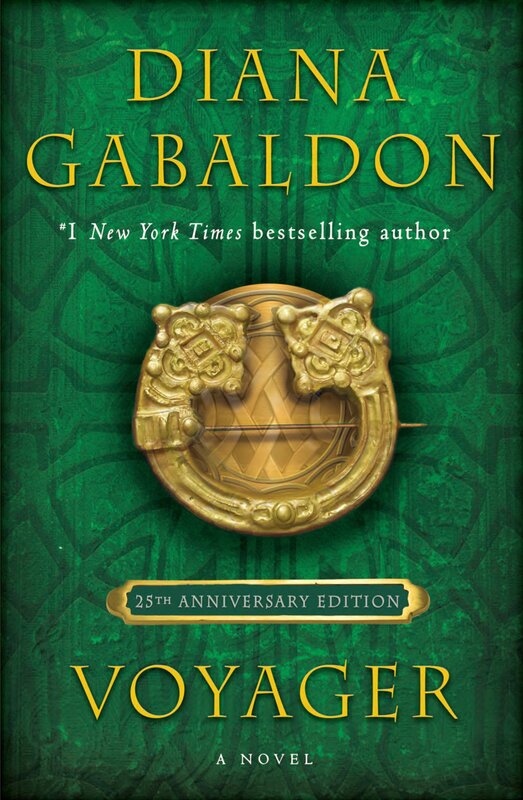 Diana Gabaldon's OUTLANDER VIII, The eighth volume in the bestselling family saga, to Nita Taublib at Delacorte Press, in a major deal, for publication in Fall 2013, by Russell Galen at Scovil Galen Ghosh Literary Agency (US). Thanks to SusiQ at LOL for letting us know! The announcement was posted on the publishersmarketplace.com site. 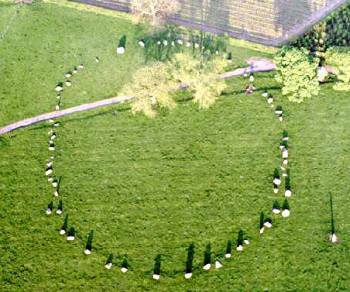 It's a pay site, and I don't have access myself, but the summary is available if you google "outlander viii 2013", if you want to see it for yourself. So, Diana has been saying for months and months that ECHO is not the last book in the series. (With all the cliffhangers at the end? How could it possibly be the last book?) Now we have confirmation from the publisher that there will be a Book 8. The books are invariably longer and more complex than I think they'll be, and _always_ take longer to finish than I think they will. General observation is that in terms of actual research/writing/etc., it takes me _about_ two to two-and-a-half years to write one of the big novels of the main series. That's baseline. That "baseline" figure doesn't include the time she spends traveling, making public appearances (such as the recently completed book-tour of the UK), and working on other projects. 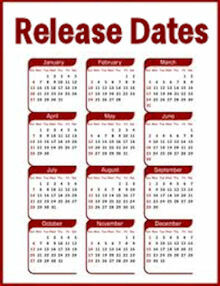 So, it looks like Book 8 will follow the pattern of the more recent books, and be released about four years after ECHO. Thanks to Electra on Compuserve for the link! If you want to join in the discussion on Compuserve, the thread is here. I have wondered, reading this scene in ECHO, whether the white deer might be Lord John's "spirit animal", in much the same way that Ian's is the wolf or Jamie's is the bear. It's actually a pretty apt metaphor for how I feel about Lord John. When he's gone from the story, I don't really miss him -- being too caught up in the lives of the other characters -- but I always enjoy seeing him again. Please note, Diana says this is NOT the final version! Also, she says the man in the middle panels is someone we've never seen before. You can see Diana's comments on Compuserve here. ***IMPORTANT NOTE*** Please don't post the picture all over the Internet! For one thing, Diana does not own the copyright to this picture; that belongs to the artist, Hoang Nguyen. For another, it's not the final version, and things may well change a bit before it's published. If you want to post a link to the picture, that's fine, but please don't copy and paste it onto your own site. Thanks. 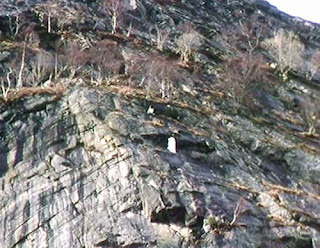 I just love the first panel, with the standing stones against the backdrop of the mountains. Gorgeous, and a little eerie. I think the difference in their heights is not quite right in the first panel. Either Claire is too tall, or Jamie is not tall enough. Wonderful to get another peek at the GN, even if this is not the final version! I have been checking Amazon about once a week to see when "The Exile", the OUTLANDER graphic novel written by Diana Gabaldon and illustrated by Hoang Nguyen, would be available for pre-order. If you want to learn more about the graphic novel, see Diana's blog entry here. Please spread the word to anyone else who might be interested! Here is another reading challenge for 2010. 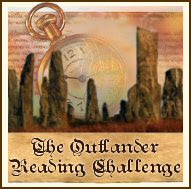 This one is specifically for the OUTLANDER series, but I didn't know about it when I posted about other reading challenges a few weeks ago. Thanks to Carol at My Outlander Purgatory for letting us know about this! That's it! Go here to sign up. I hope you'll forgive me for a rare post that has nothing at all to do with Diana Gabaldon's books. Like so many of you, all over the world, I have been following the news reports of the devastating earthquake in Haiti, and wishing there was something I could do to help. This morning I made a donation online to Doctors Without Borders, an international medical humanitarian organization providing assistance to the earthquake victims in Haiti. In these difficult economic times, a lot of families are struggling financially, and it may be hard for you to make a donation. Please at least consider it. The people in Haiti had so little to begin with, and much of that is now gone. You can text “HAITI” to 90999 to donate $10 via the Red Cross. And here is a site with more suggestions on ways you can help. Here's a blog you might find interesting, from someone living in Haiti. And a photo gallery of some unforgettable images from the quake and its aftermath. Please pass this information on to others, or suggest a link to another site where people can help. Thanks! I don't normally think much of OUTLANDER fan art (much of it is, to put it politely, not even close to my mental image of what Jamie and Claire look like). But I found a picture this morning that is truly exceptional, and I can't resist sharing it with you. The artist's name is Lilly, and that's all I know about her. The picture was posted on Photobucket, here. Isn't this gorgeous?! Jamie's eyes are not exactly the way I pictured them, but that's a minor quibble, because I think the artist got everything else just right. 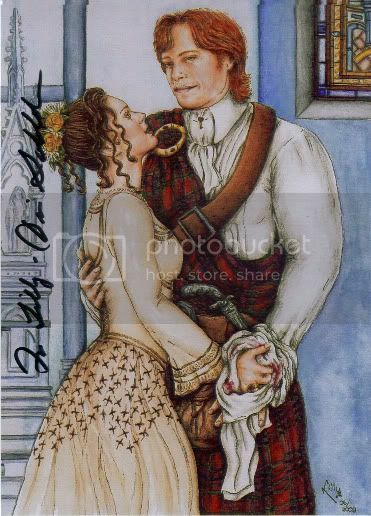 And you'll notice, along the left side of the portrait, that Diana Gabaldon has signed it! I didn't see this at first, but on a closer look, it's definitely Diana's signature. This is why I pay attention to the information I get from Sitemeter about who's reading my blog. I happened to notice this morning that someone visited my blog yesterday via a link from a site I'd never heard of before, My Outlander Purgatory, and exploring that site, I stumbled across this picture of Jamie and Claire. "What sorts of things might you like to see in THE OUTLANDISH COMPANION, Volume II?" Maps showing the (approximate) locations of Fraser's Ridge, River Run, and the important battle sites (Alamance, Moore's Creek, Ticonderoga, Crefeld) mentioned in the books. An updated FAQ with answers to the questions Diana gets over and over and over, in email and at her public appearances. How a page of the graphic novel evolves, from the preliminary pencil sketch to the final version. There are a lot of people who want a COMPANION to cover the next books of the series _now_. If they think they're confused about the details of earlier plots or don't remember a particular character now, how much worse will it be in three, four, five, six years from now? I think this is undeniably true. If I wait until the series--including _possibly_ two further novels, a prequel novel, and whatever Lord John books or other inclusions there may be (sorry, guys, _I_ get to say what belongs in this series, because I'm the only one who sees all the connections. And [cough] it's my name on the front, aye?) --the resulting COMPANION would be Way Too Big to contain anything other than the synopses and cast of characters. If I do a second volume now and a third when the series _is_ complete, we have room to include all kinds of other interesting stuff--which is why I'm asking y'all what you'd like to see, capisce? If you have suggestions for Diana, you can post them on her blog, here. There's also a thread on Compuserve, here. By all means, feel free to comment here as well! 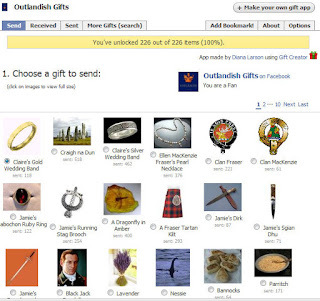 An online acquaintance of mine, Diana Larson, has created a wonderful little application for Facebook, called "Outlandish Gifts", which allows Facebook members to exchange pictures of various objects, places, and people mentioned in the OUTLANDER books. 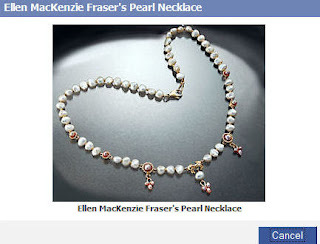 1) Log in to Facebook and go to the Outlandish Gifts main page. 2) Click on "Go to Application", just below the picture of OUTLANDER. A series of pictures (referred to as “gifts”) is displayed. The more pictures you send, the more you can unlock. 4) Choose which friends you'd like to send this picture to. Diana Larson has created more than 200 of these pictures (she's constantly adding new ones, so check back frequently for more! 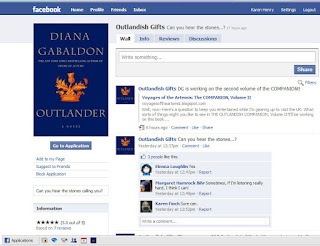 ), and various OUTLANDER fans on Facebook have sent more than 18,000 of them as gifts to other Facebook members! That's just phenomenal. I would encourage any of you who are active on Facebook to check out this gift app. And thanks again to Diana Larson for the enormous amount of work and creativity she's put into these gifts. UPDATE 1/18/2010: If you found the "Outlandish Gifts" app as a result of my post here, and you like what you see, and I'm not already on your Facebook friends list, send me a friend request mentioning this post. I'll be happy to accept it. My FB profile page is here. 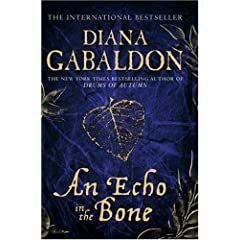 Four days and counting until the January 7th release of the hardcover edition of AN ECHO IN THE BONE in the UK! 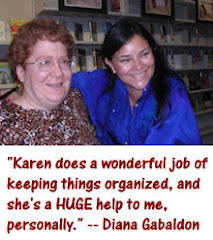 Diana Gabaldon has posted detailed information about her upcoming UK book-tour on her blog. Dates of the tour are January 14-20. It seems as though she's hardly had time to recover from the last book-tour, but as Diana pointed out when I commented on this on Compuserve the other day, it's only a week this time, not two full months! As part of this tour, Diana will be speaking at Sheffield-Hallam University, where they are showing an exhibit of the work of 19th century artist Godfrey Sykes, who also happens to be Diana's great-great-grandfather. You can see more about Godfrey Sykes and his Minerva Frieze here (be sure to watch the video, which I thought was very interesting). Diana has talked about her famous ancestor on Compuserve, here. Please spread the word to anyone you know in the UK who might be interested. Happy New Year to all of you! I hope you have a wonderful 2010! What is your favorite food mentioned in the books? I honestly thought that both the turtle soup and Jamie's sausage would rate a little higher. <g> But I have to agree, it's impossible for me to look at a strawberry now without thinking of that scene in DRUMS. There were 130 votes total in this poll. Thanks to everyone who responded! The January poll is about Lord John Grey. He's a character who tends to generate a lot of strong opinions, to put it mildly, and given the very important role he plays in AN ECHO IN THE BONE, I'm curious to see what the rest of you think. This is for the category-based voting, not for the Best Book of 2009, which seems still to be open for voting. So if you haven't yet voted, click here.